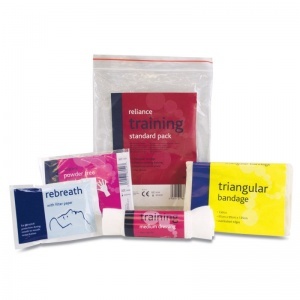 The perfect resource to use for introducing first aid, the Standard First Aid Training Pack equips students with the essential materials they need to carry out first aid training. Having a training pack allows for practical demonstrations to be given during first aid training to make courses more engaging. Providing readily available training packs to staff who are cultivating their first aid skills will guarantee a professional air to your establishment. What is Included in the Training Pack? This convenient pack comes in a secure grip seal bag that protects all of the materials within. The high quality components are reusable so that trainees can practice wound dressing, slings and CPR as many times as required. The Standard First Aid Training Pack is usually dispatched via First Class Royal Mail and delivery should be within 1 to 3 working days.